Not much is known about Mr. Bauersfeld. IMDB only credits him with voice-work for Return of the Jedi and, more recently, AI: Artificial Intelligence (he voiced a gardener). In ROTJ, however, Mr. Bauersfeld voiced two of the most popular new characters: Admiral Ackbar and Bib Fortuna. That would make Mr. Bauersfeld the reciter of such lines as Die Wanna Wanga! and It's a Trap! Mr. Bauersfeld seems more than happy to sign items for his fans. He is known to sign and inscribe items, and sometimes includes a short note. Most people have receieved a response in less than a month! Don't miss your opportunity to get this great autopgraph. Got a response in only 11 days! Mr. Bauersfeld signed and personalized my two trading cards. No answers to my questions, so I can't fill you in on any more of his career. Finally! After a while of no SW successes, today brought one of those magic envelopes. 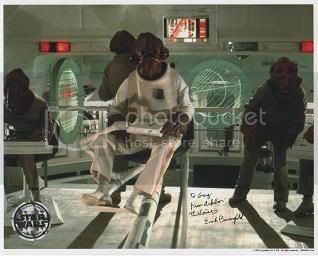 Mr. Bauersfeld gratiously signed three photos (I think I meant to send two - the third I believe was an alternate photo meant for another actor!). What made these so great were the inscriptions! 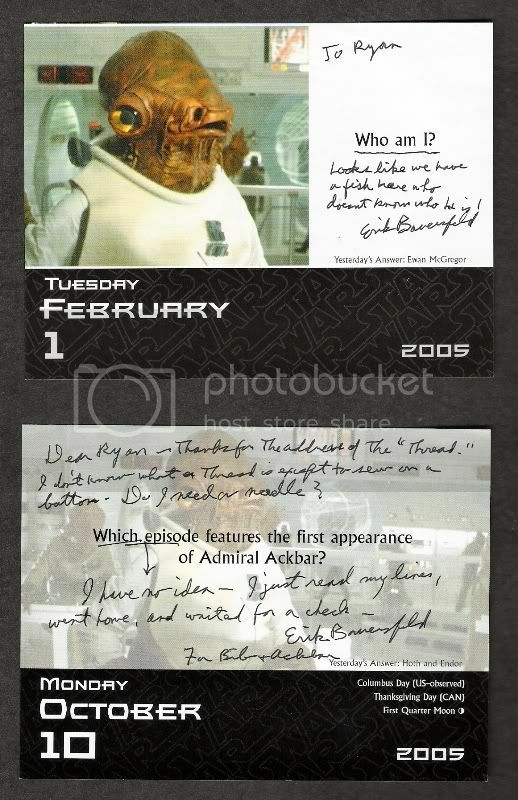 The first, a photo showing Ackbar and Mon Mothma, he signed his stock autograph ("To Bret from the voice, not the face, of ______ Eric Bauersfeld") and included a word balloon from Ackbar that said "Is this a trap?" 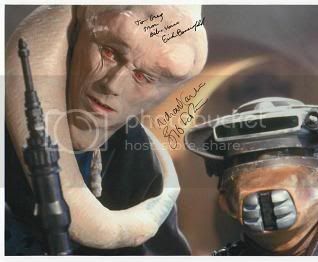 The second, a screenie I grabbed off the DVD of Ackbar actually saying his famous line, he signed the stock autograph and this time the word balloon from Ackbar said "Hi Bret - looks like it isn't a trap afterall!". The third - a shot of Bib Fortuna - is my favorite. It said "To Bret - who is Wanna Wanga? And why do I want him dead? ", a play on the classic "Die Wanna Wanga!" line. Awesome. He wrote in regular pen so I don't know if I'm going to scan them. We'll see how the digital photos come out. If so, they'll be on the website. Shameless plug #1- I'm up to 28 successes, with a bunch of non-SW folks including Streisand, Shirley Temple and a lot more. Addresses on my site as well. Shameless plug #2 - I'm still looking for a Dallas area collector who may be interested in a trade - my Temuera or Jay autograph in exchange for Ploo Koon or Watto at SciFix Expo. Please let me know if interested! I think I'll take a shot at writing mr. Bauersfeld!! Have to dig through my archives and see if I have any pictures of Fortuna and Ackbar. EDIT: Got my letter all ready to Go! It will be in the mail tomorrow! Success after 15 days! Mr. Bauersfeld signed both of 4x6 pics and hand-signed a personalized typed reply letter. He replied to my questions about how he became involved in the films...quite interesting. He said that he didn't even know what he was recording the lines for when he did them. He also said he's NEVER seen the other films except for the one he voiced for (ROTJ). I thought it was pretty interesting. Great success! Mr. Bauersfeld signed and personalized all my items with very funny quotations!! He also used my SASE. Very fast response time!! Very happy! RYAN J.
P.S. I mentioned this thread to him in my letter so hopefully he has checked it out!! He sign all of the items that i sent and wrote a short note on the B&W that i sent. He used to be much quicker. Maybe he took a break. I just got mine back after waiting about 6 weeks. I got mine back today, 2 week turnaround, signed 2 images I sent and added a cool message to both. Recieved my success from Mr. Bauersfeld after about a month. He signed my small photo of Ackbar, 2 trading cards and wrote me a small note. 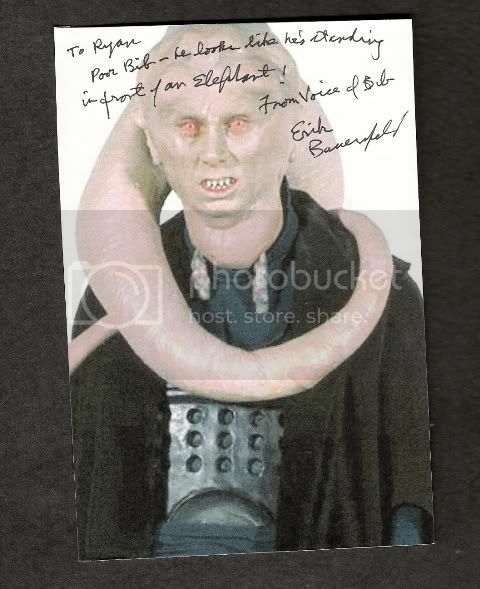 Got my Bib Fortuna trading card and index card back, both signed. He wrote "To Jason, from the voice of Ackbar and Bib" on both.